We offer wide range of Brackets & Shackles. Manufactured using superior quality material, these have perfect finish, durable nature and rust & corrosion resistance. These SS and metal shackles rigorously constructed as per latest standards of industry using hi-tech machinery to ensure high efficiency and optimum performance. 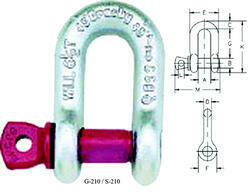 We use HMT Stainless Steel Large Dee Shackle aisi :304 or 316. 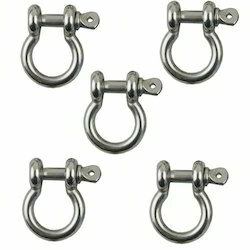 Genuine Alloy Grade 80 D shackle available with us of all sizes. We sell them at the most competitive price! We offer a comprehensive range of sturdy, strong and dependable Anchor Shackles that is used in a number of industries such as shipping, automotive, electrical and chemical industries. Our anchor chain shackles and steel anchor shackles are manufactured at vendor's end, using quality iron and steel. These have a high load bearing capacity and can be relied on for multiple applications. Material(All Grade) : Mild Steel, Stainless Steel, Carbon Steel, Alloy Steel, Brass, Copper Etc.